Based on the results of 2015 Census of Population (2015 POPCEN), Mindanao had a total population ofmore than 24 million as of August 1, 2015. About 23.39 percent of which were reported be followers of Islam. 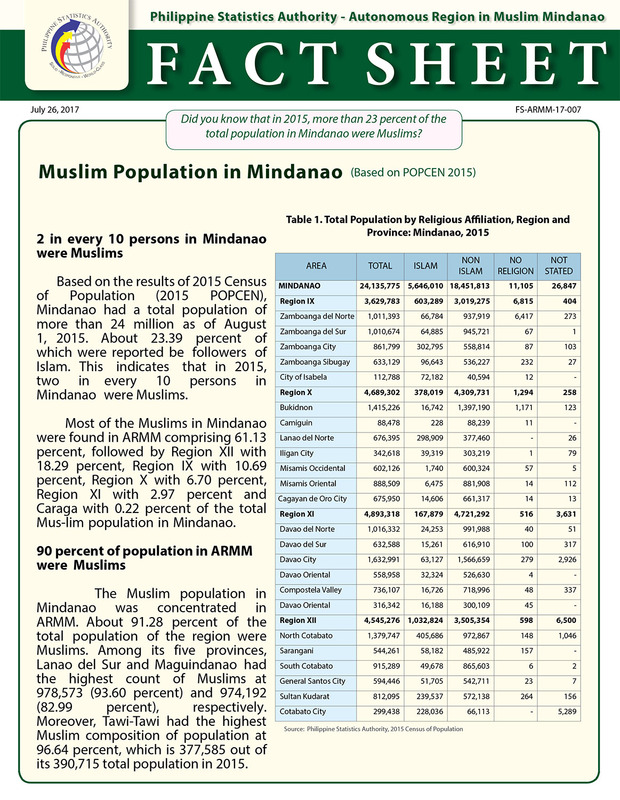 This indicates that in 2015, two in every 10 persons in Mindanao were Muslims. Most of the Muslims in Mindanao were found in ARMM comprising 61.13 percent, followed by Region XII with 18.29 percent, Region IX with 10.69 percent, Region X with 6.70 percent, Region XI with 2.97 percent and Caraga with 0.22 percent of the total Mus-lim population in Mindanao. The Muslim population in Mindanao was concentrated in ARMM. About 91.28 percent of the total population of the region were Muslims. Among its five provinces, Lanao del Sur and Maguindanao had the highest count of Muslims at 978,573 (93.60 percent) and 974,192 (82.99 percent), respectively. Moreover, Tawi-Tawi had the highest Muslim composition of population at 96.64 percent, which is 377,585 out of its 390,715 total population in 2015. More than one million or about 22.72 percent of the total population of Region XII were Muslims. Though only three out of 10 persons in North Cotabato follow Islam, the province houses most of the Muslims in Region XII in 2015 at 39.28 percent of the total population of the region. Furthermore, 76.15 percent of the population in Cotabato City were Muslims, while South Cotabato and General Santos City had the least percentage of Mus-lim population in the region at 5.43 percent and 8.70 percent, respectively. A total of 302,795 persons, or 50.19 percent of the Muslim population in Region IX were found in Zamboanga City. This group comprise 35.15 percent of the total population of the said city. Muslims in this region were most concentrated in City of Isabela comprising 64.00 percent of its population. The number and percentage of Muslims in Region X were highest in Lanao del Norte comprising 44.19 percent of the total population of the province or a total of 298,090 persons. Level of Muslim population in each of the remaining provinces ranges from 0.26 percent in Camiguin to 11.48 percent in Iligan City. The percentage of Muslims in each of the provinces of Region XI ranges from 2.27 percent in Compostela Valley to 5.78 percent in Davao Oriental. In terms of population count, most of the Muslims in the region or 39.28 percent reside in Davao City occupying 3.87 percent of the total population of the city. Only 0.48 percent of the total population of Caraga were Muslims. The percentage across provinces varies from 0.04 percent of Dinagat Islands to 1.09 percent of total population of Butuan City.